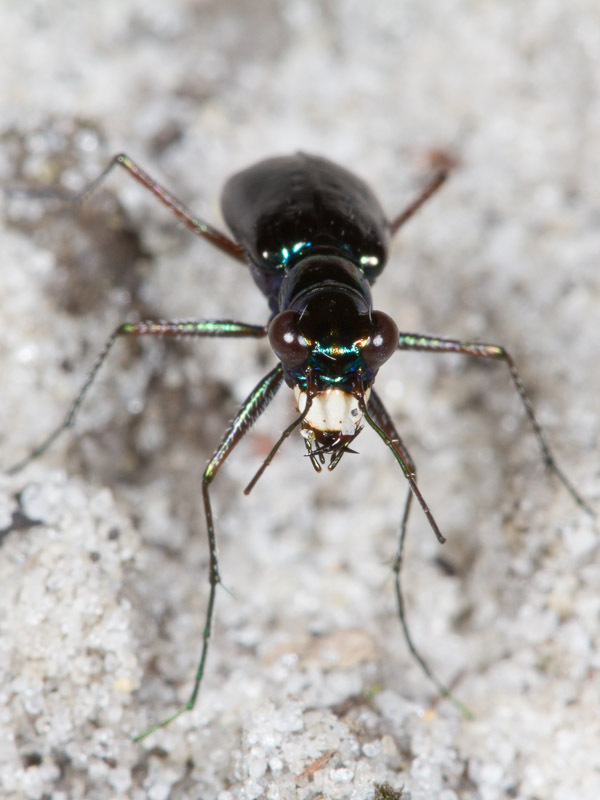 I wasn’t properly excited when I photographed this tiger beetle. 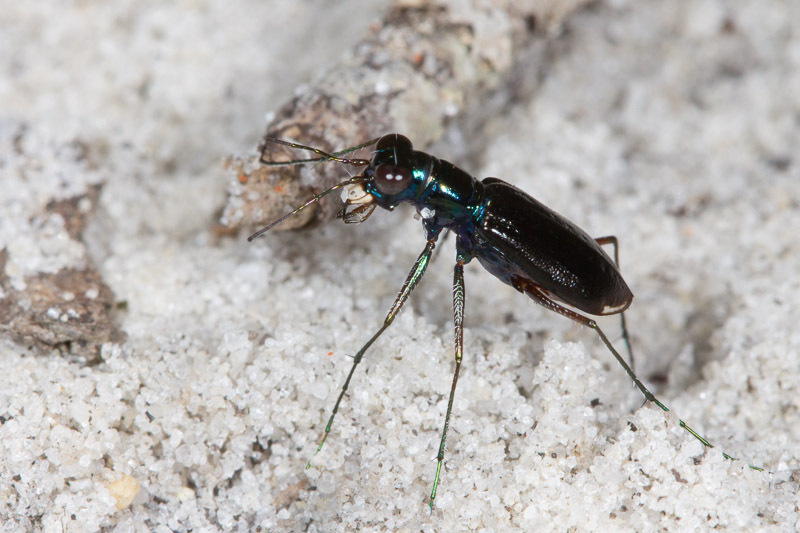 I now know this species, Cicindela highlandensis, is a somewhat rare endemic species. There were no shortage of them at this particular spot though. Head on view, Ted’s trademark shot I think. I like those single small hairs that stick up from above each eye. 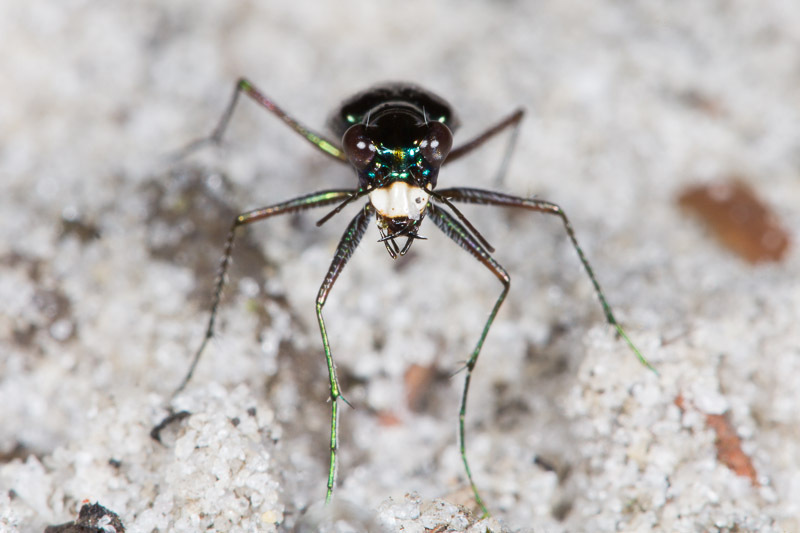 These really are relatively small tiger beetles. I’m guessing that doesn’t stop them from tangling with big prey though. Looks like this one perhaps bit off more than it could chew, since it seems to be missing some antennal segments. Their dark color allows them to blend in quite well with all the other debris scattered about their sandy habitat. You don’t really notice them until they take flight. I’m going to follow Ted’s lead and not reveal here the exact location where these were found. Looking at the timestamps of my images, I spent less than five minutes chasing this one beetle. If I go back, you can be sure I’ll spend more time photographing this species. These are great – I’m jealous of your first head on shot! I spent quite a bit more than five minutes trying to photograph them when I was there, but I’d only been doing the macro thing for three months at that time. I’m anxious to go back and try again with a little more experience under my belt. Small but incredibly impressive if you ask me! 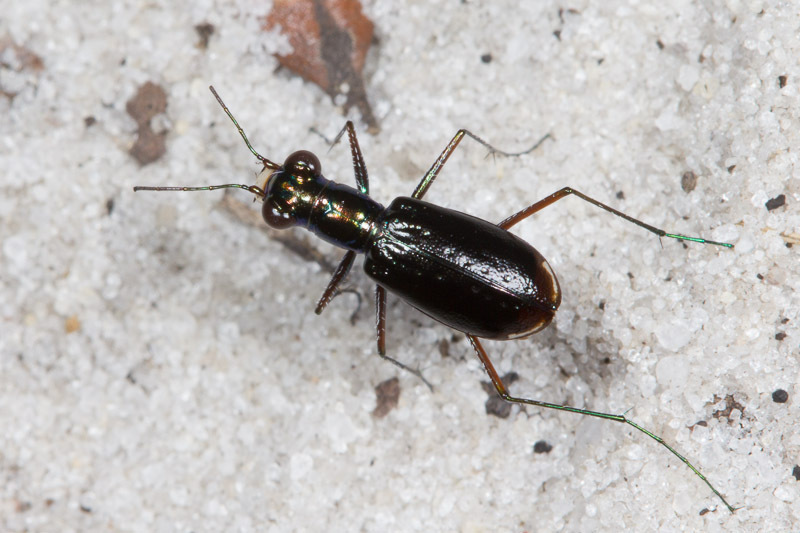 🙂 Florida is amazing for insects, it’s too bad most of the good spots are National or State Parks, making it difficult to collect. But at least they’re not parking lots, so it’s good in a way. I agree about collecting. I don’t maintain a collection, but I do sometimes like to collect things for rearing and later release (especially caterpillars). I’ll often avoid places I know I can’t collect in favor of areas I know I can. And thus is the great failure of permitting requirements – they most serve to discourage research. Regulators fail to realize that a large part of taxonomy is built on the efforts of amateurs who collect and then donate/will their collections to public museums, making it available for scientists conducting taxonomic work. I wholeheartedly agree with the need to prevent abusive collecting of selected species, but the onerous system of requiring full research applications for each park that Florida used to have does not accomplish that any more than their previous “research associate” system that provided blanket permits to all (with a few exceptions) state parks. Now, instead of mostly responsible collectors working in parks, only a few bad seeds go there and the good collectors that don’t want to deal with the bureaucracy go elsewhere. Sensitive insects are still being collected, but there is far less responsible collecting taking place to feed science. It’s a shame. Sorry for getting on the soap box!